The main goal of flying out to California was to demonstrate a shoot thinner that automatically adjusts for variability in the vineyard. As we pulled into the vineyards I became confused as to where, in the row upon row of identical vines, were we going to find enough variation to justify variable rate management. Of course, what the human eye can detect is very different from what infra-red sensors could detect. The Efficient Vineyard project uses infra-red sensors to detect changes in shoot health or vigor based on the light they reflect. These are more sensitive than the human eye and can pick up underlying differences that would otherwise go unnoticed. The VMech-2220 is a two row tool carrier that requires three operators: two on the trailer to control the arms and one to drive the tractor. Scheid Vineyards had already been using this rig for set rate shoot thinning. VMech has made and sold these trailers for some time now without the variable rate option. To adapt to variable rate, the machine has to be altered so that a field computer can control the flow of hydraulic fluid to the drive motors (which control the paddles), creating the necessary speed control. That speed is determined through calibrating the machine by testing speeds and calculating shoot removal percentage for each vineyard. Other adjustments include a monitor for uploading and viewing prescription maps, GPS and wiring so that the grower or vineyard manager can create a connection between the field computer with the prescription maps and the trailer. All of the data points used to build a prescription map are embedded with a location. By attaching a GPS to the shoot thinner, the paddles change their speed to correlate with the information associated with that part of the vineyard. Scheid Family Wines owns and operates around 4,000 acres of grape vineyards in the central valley of California.From that, two blocks of Pinot Noir growing two different clones were selected for Efficient Vineyard research trials, B-02 and B-03.B-02 reflected the uniform growth that I expected, B-03 showed why we use sensors.In B-02, most of the shoots were between six and eight inches long while B-03 had variable growth with some areas only grown out by one to two inches and some parts as long as four inches.Both however had roughly the same average number of shoots. Our research plot surrounded ten rows in the middle where Scheid crews had hand pruned back 5 to 10 rows at the beginning of B-03 with a lower shoot density than the rest of the vineyard.These rows can be seen as a red stretch near the border of B-02 and B-03. On the third day of our trip, the demo was scheduled for 1 PM at which point the skies promptly opened up and rained on us for about an hour. This however, did not dampen the excitement of the viewers who came out with rain jackets and umbrellas to watch as the shoot thinner switched from a gentler shoot thinning speed to rapidly removing half of the shoots. Like the Concord vineyards along Lake Erie, there is a sweet spot where the vine ripens fruit in a timely manner and meets quality standards without being overtaxed or undertaxed (vine balance). The counts we were collecting suggested that the shoot thinner needed to bring the number down four to nine shoots/foot of row depending on the zone. That would create the desired shoot density between our averages (24 to 27 shoots/foot of row) and the hand pruned vines (10 shoots/foot of row). After we knew how many of the shoots needed to be removed we were able to calibrate the machine so that the shoot thinner knew what speed to move the paddles based on what zone it was in. Variability is a common characteristic of vineyards regardless of location, climate or soil type and therefore could be approached across the board using variable rate technology. On this trip we were able to show how such technology can be implemented even in vineyards with limited variation. 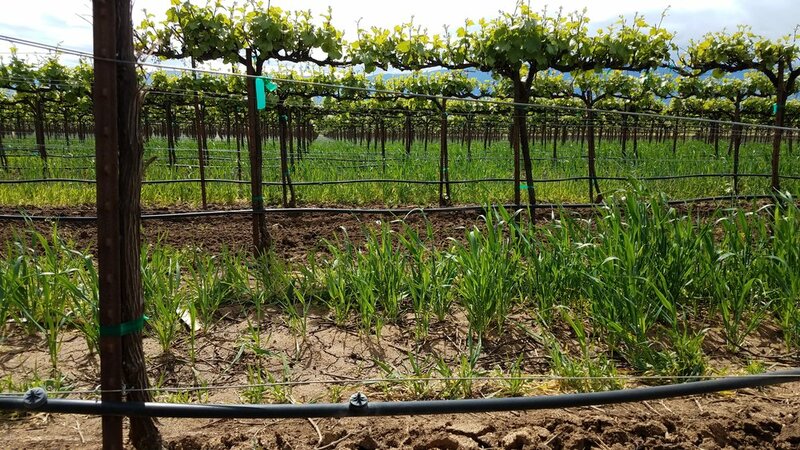 Scheid vineyards was the perfect vineyard to display not only the potential of variable rate shoot thinning, but also that it may take sensors to detect variations within a vineyard. The Efficient Vineyard researchers will be back out to California by the time you are reading this, hopefully to meet with the same success that this excursion produced!